ITL DC Review 2019: Is ITL DC a Good Hosting? ITL DC provides consumers and businesses with shared, reseller, VDS, and dedicated server hosting plans. It offers SATA and SSD hosting via servers in Europe, the U.S., and Asia. With headquarters in Bulgaria, ITL DC is an international group of companies that specializes in shared, colocation, VDS, and dedicated hosting services. The ITL Group has been in business since 1995 and its engineers are specialists in UNIX OS, Juniper Networks, and Cisco Systems hardware. The ITL DC website is available in Bulgarian and English. ITL DC offers professional hosting and server solutions for personal, business, and reseller purposes. Because a large part of its business is focused on renting server space to hosting resellers, much of its website is directed at these commercial users rather than to typical consumers. However, individual consumers and SMEs can choose between shared cloud, virtual dedicated server (VDS), and dedicated server hosting plans. Shared cloud hosting plans start out with one supported domain, 1GB of disk space, ten email accounts, anti-spam protection, PHP support, and one MySQL database. From there, you can increase these to 50 domains, 30GB of disk space, 500 email accounts, and 50 MySQL databases. Auto-installation of software such as WordPress comes included with hosting plans, which will make it easy for non-technical customers to get up and running quickly. If you currently have a website hosted elsewhere, ITL DC provides free data migration from other platforms to its servers. Users with increased hosting needs can upgrade their level of service to VDS or dedicated hosting plans. VDS plans include 10-50GB of SSD RAID storage, 1-8GB of RAM, 1-8 CPU cores, 1 IPv4 and 1 IPv6, and unlimited bandwidth. Dedicated server options include multi-core Intel processors, 8-32GB of RAM, and SATA or SSD storage. 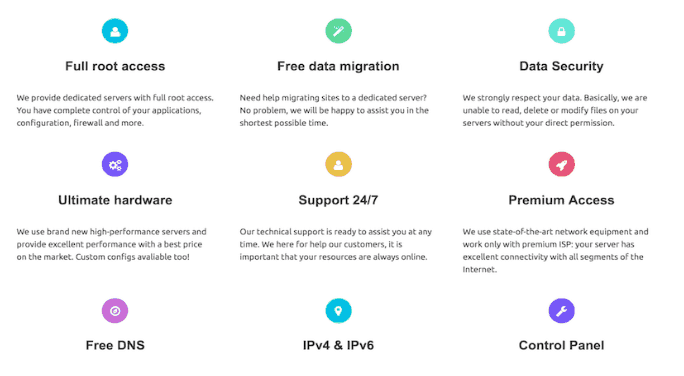 Dedicated plans also offer the option to install any operating system of your choice including CentOS, Debian, Ubuntu, and FreeBSD. Furthermore, with each hosting plan, you can choose the server location you’d like to have your hosting based from. 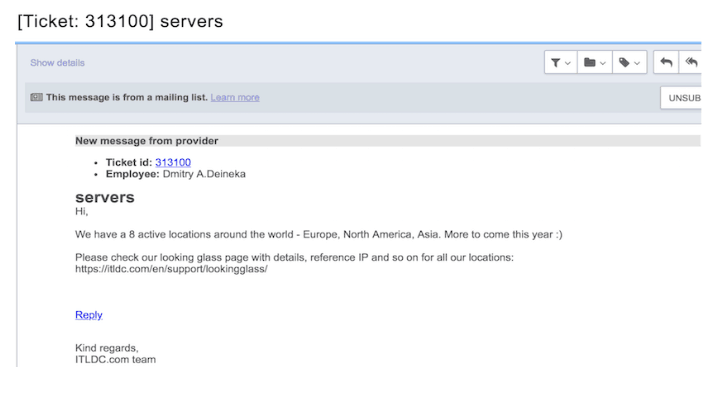 Shared hosting plans only offer a choice between Amsterdam or Ukraine. VDS and dedicated plans allow customers to pick between the locations above as well as Bulgaria, Ukraine, Latvia, U.S., and Singapore. Pricing for the ITL DC hosting plans is very competitive and represents a solid value. The entry-level plan is priced around 50-75% less than many top European and U.S. providers. This plan comes with enough data and features to get a simple website going. Payment options are flexible and include the ability to pay through many different channels including credit card, PayPal, bank transfer, and even cryptocurrency options BitPay and CoinPayments. Terms are available by the month, 3-month, half-year, and yearly. Refunds can be requested within the first 14 days of starting a hosting plan and will be paid out via electronic bank transfer. Customer support is handled via a ticketing system once users are logged into the self-service system. There’s also telephone and email contact information on the ITL DC website with customer service locations in Bulgaria and the United States. I received a response to my support query in the same business day. For an affordable hosting experience with data centers in Europe, Asia, and the U.S., ITL DC represents a great value. The website lacks an abundance of consumer hosting plan information, but the vendor does offer solid plans for beginners as well as advanced users. Wondering how ITL DC stacks up against other Web Hosting companies? Enter any other Web Hosting company and we will give you a side-by-side comparison.